Dating back to 1879, the Technical University of Berlin (Technische Universität Berlin, also referred to as TU Berlin) has been one of the most respected educational institutions in Europe since its inception, and has produced hundreds of prominent scientists and researchers. To keep pace with students’ expectations and remain on the cutting edge of modern education, TU Berlin sought to refurbish two of its auditoriums with upgraded AV systems. With classrooms and other university buildings located throughout the city, TU Berlin needed a solution that could work well across a relatively wide geographical area. 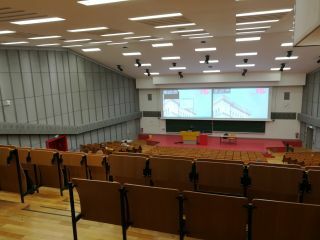 To keep pace with students’ expectations and remain on the cutting edge of modern education, TU Berlin sought to refurbish two of its auditoriums with upgraded AV systems. TU Berlin’s primary AV decision-maker was seeking a cost-effective solution that wouldn’t compromise system quality. Macom and MMT Network, the consultants responsible for designing the solution for the different rooms, initially suggested an HDBaseT solution. However, the university changed the scope of the installation slightly by requesting that the two rooms being refurbished have the ability to be combined to accommodate larger audiences during special occasions such as welcome addresses on the first day of school each year. In addition to the ability to combine rooms 104 and 105, the university required overflow capabilities that would allow events from one room to be broadcast to the other if demand exceeded seating capacity. To accommodate these requests, the installation required a more flexible solution. Originally refurbished in 2005, Room 105 was in need of a considerable upgrade in order to meet students’ needs. To maximize funding and reduce waste, university staff wanted an updated AV solution that allowed them to maintain portions of the original system, which was based on Biamp AudiaFLEX devices and used CobraNet for audio and video distribution via DVI and RGBHV connectors. TU Berlin was seeking an IP-based AV solution that could accommodate this expansion. Room 104 became one of the first education auditoriums in the world to run both the audio and video systems on the same network. To accomplish this, the room needed to take advantage of the capabilities provided by audio video bridging (AVB) technology, which includes provisions for bandwidth reservation, precise time synchronization, and much more. Because TU Berlin officials value quality and strive for excellence, they prioritized achieving the lowest possible latency and the lowest compression rates possible. To achieve its goals, the university selected a Tesira solution from Biamp Systems. The installation includes a total of 26 TesiraLUX encoders and 18 decoders. These are connected to the lecture desk, front of house, stage, and control room, as well as to four adjacent interpreter rooms. In addition, both rooms have connections to the Lichthof central meeting point, situated 100 meters from the primary space. All devices on the network are connected using multimode 10G fiber, and two different technical rooms provide support for the different signals. The ZGR-M technical room manages media engineering devices via an Extreme Networks switch, while the Wiring Center uses Cisco switches for control. Both rooms have Wacom Pen Displays allowing professors to use an interactive chalkboard to draw out lessons in real time. These displays also double as preview monitors. TesiraLUX provides the low latency required for students to view the words and diagrams created by their professors nearly instantaneously. Low latency was a mission critical element of this installation to ensure that the information being shared by professors was visible to students without delay or distraction. As part of the mission to maintain elements of the original system, a new wiring structure needed to be built between the rooms and other related locations that included multimode fiber, as well as Ethernet connections to the Wiring Center. This new wiring configuration connects multiple floors to the AV system, supporting future expansion as the university constructs or refurbishes additional buildings. Together, Rooms 104 and 105 can accommodate approximately 1,200 students. The rooms can also be combined into a single space when needed.